My friends and coworkers know that I’m a big fan of J.K. Rowling’s Harry Potter series. This year, interest in the boy wizard and his world was heightened by the spring opening of the Wizarding World of Harry Potter at Universal Orlando. 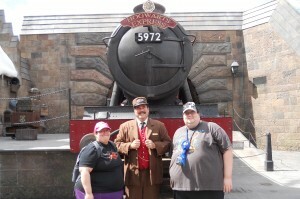 (That’s me and my wife with the Conductor of the Hogwarts Express). Dozens of new Harry Potter toys and trinkets are available for purchase this holiday season. And, Harry Potter fans will be lining up tonight at their local cineplex to attend the midnight opening of Harry Potter and the Deathly Hallows: Part I.